Description: The dense flower spikes occur mainly at the branch tips and contain both staminate (male) and pistillate (female) flowers. 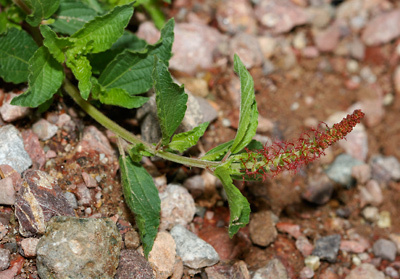 The tiny, rounded staminate flowers have red bracts and are found at the tip of the flower spikes. The pistillate flowers have red, feathery stigmas and are at the base of the flower spikes. The flowers are followed by bristly-haired seed capsules. 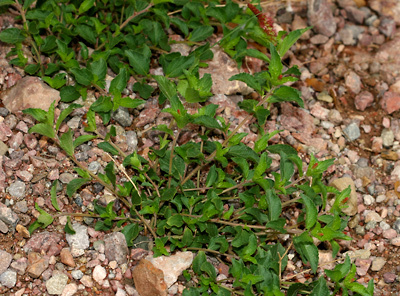 The leaves have serrate (saw-toothed) margins except near the lower 1/3 of the leaf, very short petioles, and an acute (angle less than 90 degrees) tip and base, and are green, sparsely to moderately hairy above and below, edged with a fine fringe of hairs, alternate, and elliptic, egg-shaped, or almost round near the base of the plant. The stems are hairy and prostrate to ascending. The similar California Copperleaf (Acalypha californica) is a shrub or subshrub that has leaves with long petioles that can be almost half the length of the leaf blades, leaf bases that are truncate, rounded, or cordate (heart-shaped), mostly or totally staminate flower spikes in the leaf axils that have only 0 to 3 pistillate flowers, and flower spikes at the branch tips with only pistillate flowers. 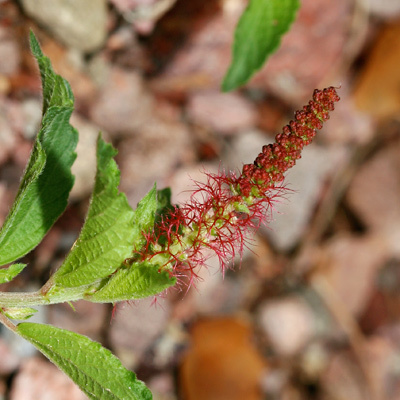 New Mexico Copperleaf (Acalypha neomexicana) is an annual herb that has leaves with short to long petioles, rounded leaf bases, only staminate flower spikes in the leaf axils, and only pistillate flower spikes at the branch tips.